This cake was made as part of my vegan baking blitz - exploring the word of vegan baking! Accidentally, this cake also happens to be gluten free. Since olive oil cake is one of my favorite cakes (tried three different versions here, here, and here), a vegan version was a must. 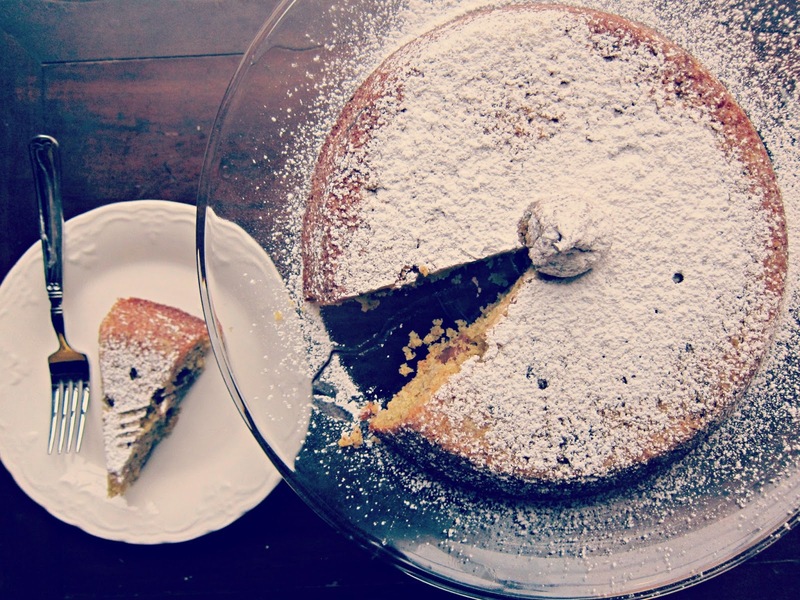 I was inspired to make olive oil cake again after reading one of my favorite blogs, Souvlaki For The Soul after reading Peter's recipe for a semolina based olive oil cake. 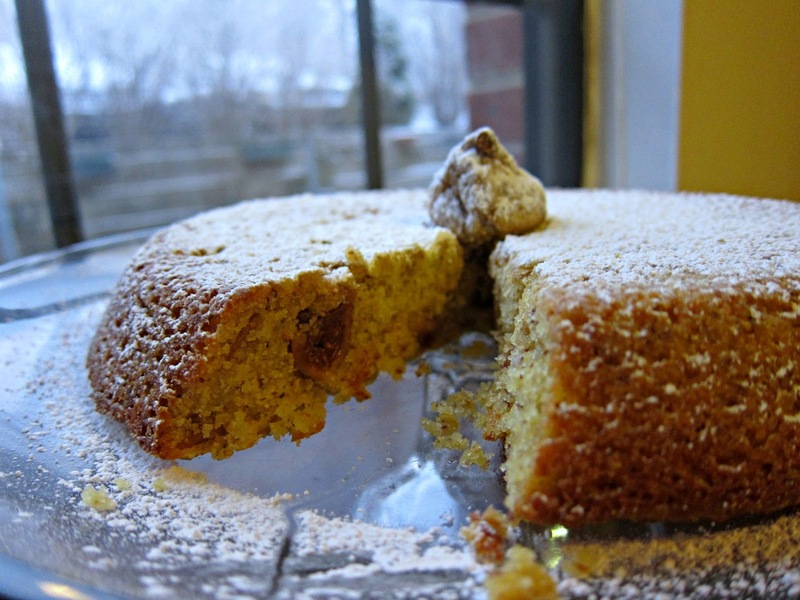 My favorite olive oil cake has cornmeal - something about the grittiness of the corn and the olive oil merry so well together. This time around I used semolina that picked up in the Italian district of Philly. I wasn't planning on adding figs until my husband came home with a haul of beautiful dried figs on baking day. They were going straight into that cake and the rest saved for cheese (and wine!) when Great Lent is over. When I think of figs, I often think of one of the most delicious cocktails I've ever had containing both whiskey and figs (at the Sapphire Hotel in Portland) - so whiskey naturally went into the cake. These were some distracting ingredients to make you not miss the eggs and milk this cake might have never needed. In a small bowl, pour 1 1/2 cups hot water over figs. Let sit. In cup, combine the rest of the hot water and flax seeds. Combine semolina, almond flour, salt, and baking powder in a medium sized bowl.Mix in olive oil, sugar, whiskey, and flax seed mixture. Stir until everything is smooth. Drain fig and add them in. Pour into a greased baking vessel of your choice and bake for about 30 minutes. Cool and dust with powdered sugar, add extra figs for aesthetics! Beautiful Anna! Love this variation. And you're words are too kind . We use many time olive oil in cakes in Greece, looks so yummy! Figs and olive oil...a fine combo for the ages! Mmm, figs! My favorite! Was so great seeing you last week!! What an amazing cake! I love olive oil cakes, although they are more dense than others but the taste of olive oil is just amazing. Figs is also one of my favourite fruit as well! P.S. I can't understand why I cannot comment using google chrome on your blog. It seems okay with Firefox. Anna - Thank you, I used picmonkey to edit my pics (it's free!). Peter - You're the best! Beauty Follower - Love using olive oil in cakes, Greek I am! Peter - no doubt, so classic. Esi - Great seeing you - I may be back in a month. Ivy - Thank you, weird - especially since blogger is google based.